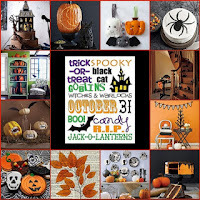 I am writing a quick post to wish everyone a Happy Halloween and Happy Trick 'n' Treating. 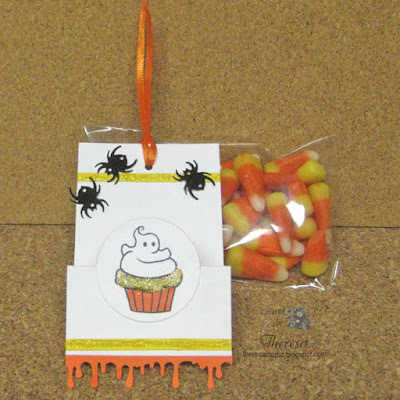 I have a little treat of Candy Corn, so help your self. I made a tag for my treat using a cute Digi from A Day for Daisies that I colored with Copics and Stickles Yellow Glitter Glue. The inside was stamped with Mark's Finest Paper stamp in black ink and embossed with clear EP. Finished with strips of Yellow and Orange CS. I think the plastic spiders are trying to get into the package of candy. Tag You're It! 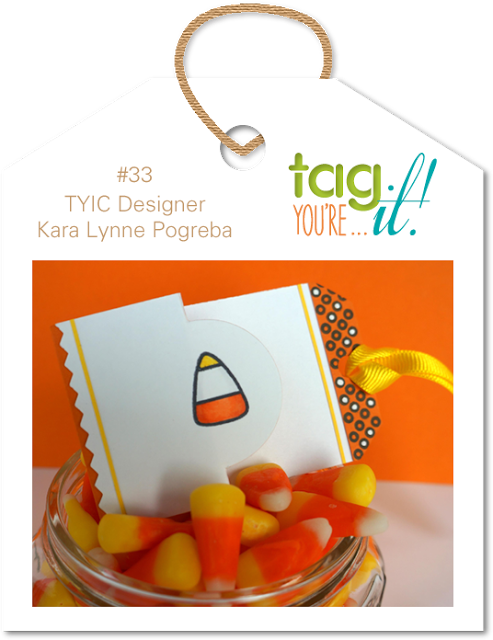 Challenge: #33 by Kara Lynne ...used colors, layout, and theme from the inspiration tag. Life Is Good If You're a Duck? Hello! 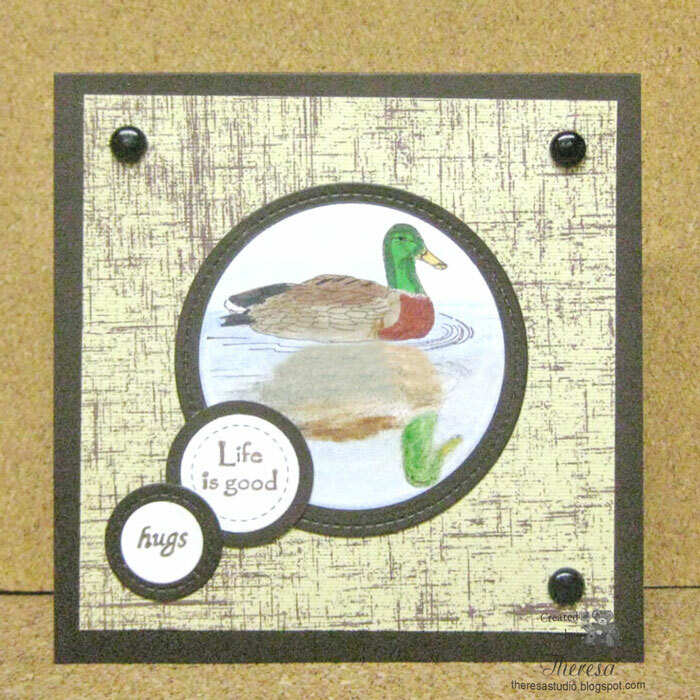 Today I have a masculine card with a Duck theme made for The House That Stamps Built What If ? Wednesday Sketch #02815 Challenge. I used Repeat Impressions Duck Stamp with Memento Rich Cocoa ink and colored with Copics and Pencils. I did a reverse stamping of the duck to create a reflection in the water. Other Supplies: Repeat Impressions Hugs from a Sentiment Stamp, GKD Life is Good Stamp, Brads, Lawn Fawn Stitched Circle Dies, Nesties Circle Dies, DCWV Pattern Paper from Safari Chic Pad, GKD Brown CS. 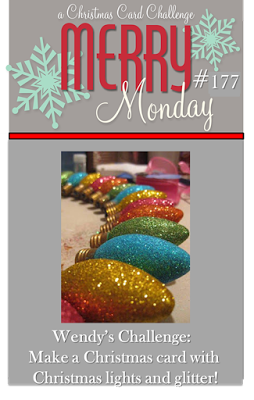 This Christmas card is bright and glittery and made with a Silhouette file of Christmas Lights cut from Black CS and Assorted Glitter Card stock. I assembled the string of lights on an embossed (Divine Swirls) Glossy CS layered on pattern paper from Crate Paper. The card base is more of the Glossy CS. Sentiment from Power Poppy was heat embossed with gold EP (looks green in photo?). Hello my friends! 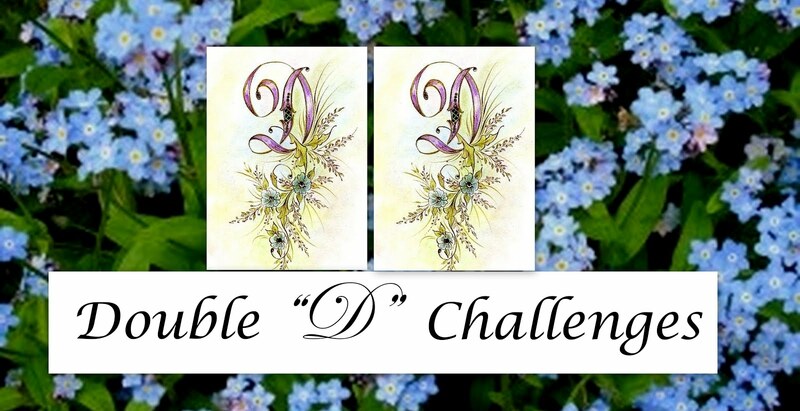 I seldom create more than one card for the same challenge, but when I show my DH the graphic, shown below right, for The Shabby Tea Room challenge, my DH spotted the owl on the upper right corner. I thought...why not make him a card that features an owl and I had the perfect embellishment to feature. I recently won a package of embroidered embellishments from Brenda at craftybrensembroideredtoppers.weebly.com including this adorable Owl. I used some of the same elements that I used in my first card for the challenge. 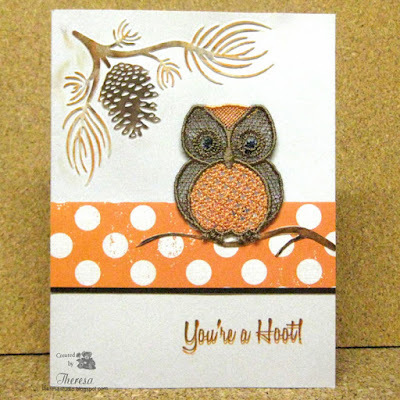 I simply made the card with Darice EF Pine Branches, a Strip of Polka Dot pattern, a Mark Finest Papers stamp, and the Owl..
Other supplies: Memento Rich Cocoa and Tangelo inks, Light Gray CS, Scrap of Brown CS, Fussy Cut Branch, Glossy Accents for adhesive. 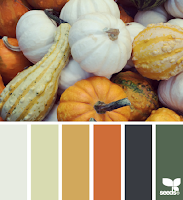 The Shabby Tea Room: Challenge is Week #262 Colors and Patterns. My Owl is just the right colors for this challenge. 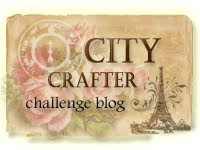 City Crafter Challenge Blog: Week 285 Creatures of the Night. My Owl may now be spooky but he is cute! So this card is for my DH.....he is just a bit of a hoot, but....he is really more a Wise Old Owl. Hello everyone. My card today is another Christmas one made with a Silhouette Cut File Simple Nativity. 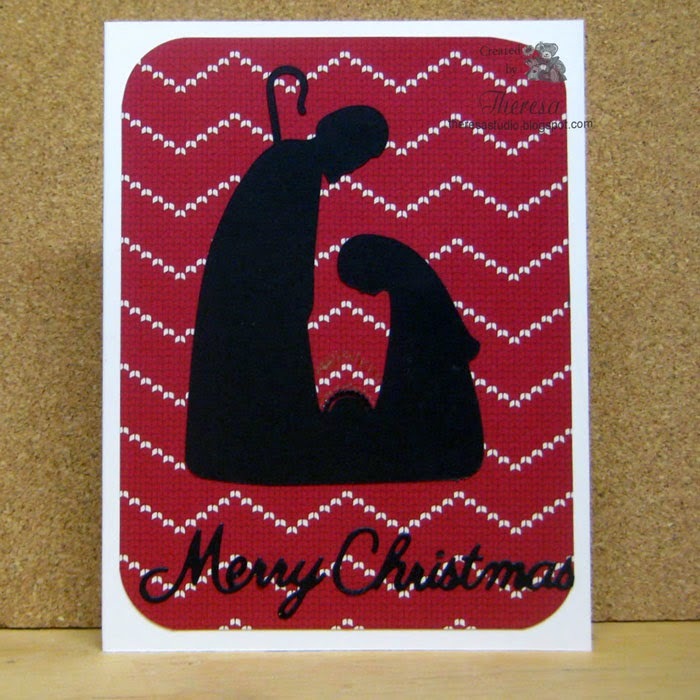 The black silhouette was attached to a pattern paper from American Crafts Kringle & Co pad and then another pattern before adhering to Bazzill Berry Sensation Card Base. Stamped a simple sentiment from GKD in black ink. Question of the day: Should Mary be on the left or right? In the original file she is on the right but I accidentally reversed the silhouette when I assembled the above card. 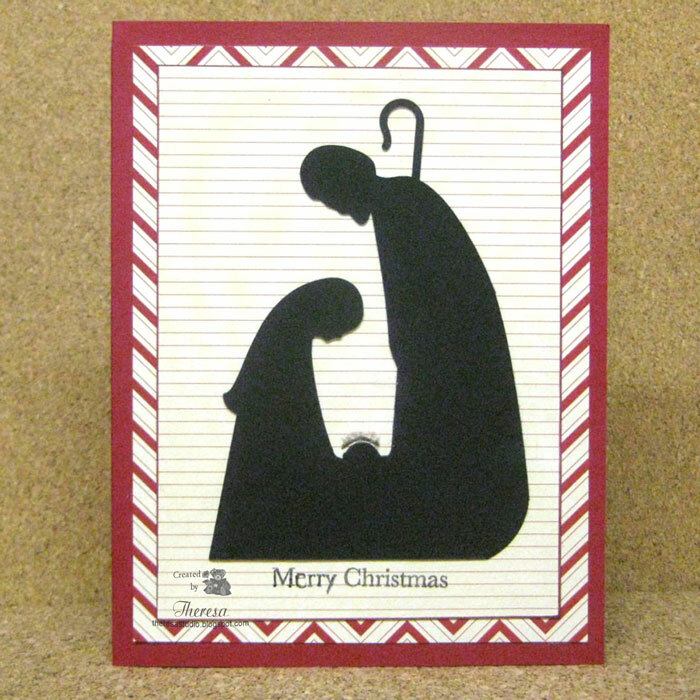 When looking at other Nativity images the arrangement of the Holy Couple varies. 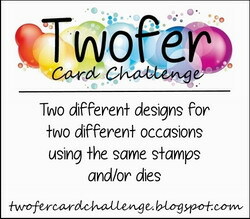 On the right is another card that I made last year with this file but arranged same as in file. Welcome friends! 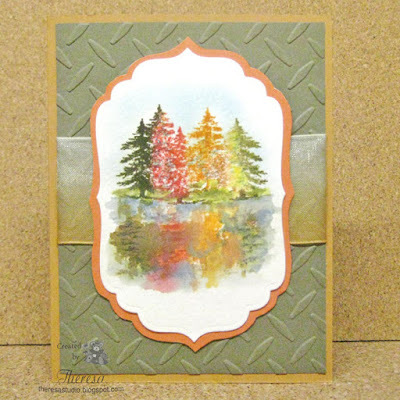 Today I have an entry for Stamp TV's Mix It Up Monday Challenge for Judy's Challenge Splatter Matters....to use some type of splatter on your card. I used glue for my splatter and then sprinkled on Stampendous crystal glitter on to give some sparkle and shine. I colored my image stamped on watercolor paper with Distress Inks. 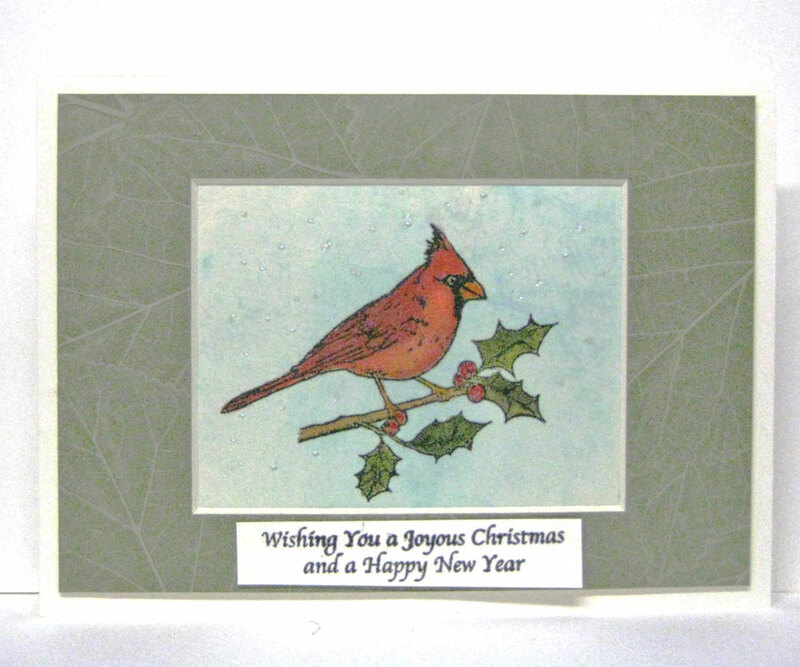 I pulled out a 5x7 mat that I had bought on clearance and framed the cardinal with that and then added to Ivory CS card base. I may decide to frame this and hang or I have the option to use as a card. 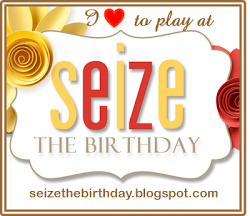 Below I am showing with a sentiment that I would use with the card option. (It is attached with removal tape in case I decide to frame). 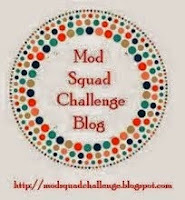 Mod Squad Challenge: Bold and Beautiful. I think my bird fits this challenge. My photo with the sentiment shows it coming loose. Did not notice that until I posted. OOPS! Hello! The challenge at The Shabby Tea Room for week #262 is Colors and Patterns shown in the graphic on the right. When I saw the colors, I thought of a Thanksgiving card and pulled out polka dot and chevron patterns to use on rectangles --the shape inspired by the shapes of the bottles. The pine cones in the photo reminded me of an Embossing Folder Pine Branches by Darice. I began the card by embossing a Ecru Glossy card stock and inking the raised designs with Memento Rich Cocoa and Tangelo inks. I cut the strips of Pattern Paper from Echo Park and created the chevron pattern by embossing a strip of the Ecru glossy paper and inking the surface. I fussy cut another pine cone using the EF and attached to the lower corner. I cut the words with Cheery Lynn Dies to finish the card. I think I managed to capture some of the colors and patterns from the inspiration. Hello Everyone! I am thrilled to have again won the opportunity to be a guest designer at the Retro Rubber challenge blog. 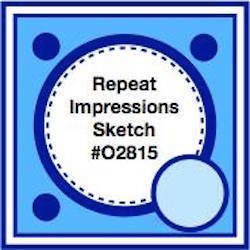 The challenge this week is a Sketch Challenge, shown in the graphic above. 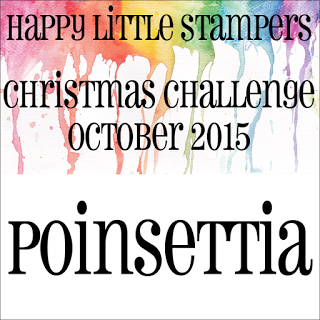 The fabulous ladies have asked me to join them for this challenge using a stamp that is at least 1 year or old. 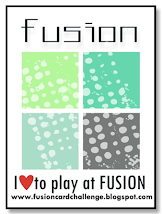 Please visit their blogs to check out their great designs. 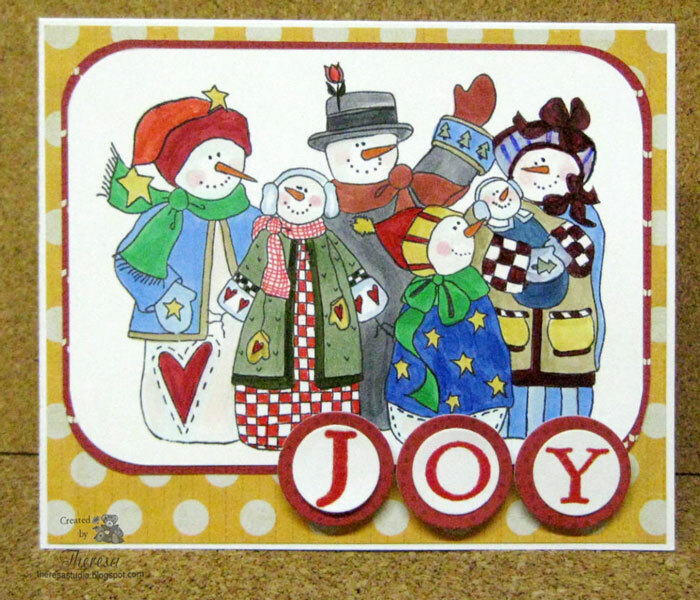 Since I have been working on Holiday Cards, I decided to use the Sketch with an old 1999 Inkadinkado (discontinued) stamp of "Snowman Family" from Michael's by Alma Lynne Designs. I used a bunch of Copics to color the Family after stamping with Memento Tuxedo Black ink on White CS. After rounding the corners of the image, I framed with a pattern paper and then layered onto another one and a White Card base. 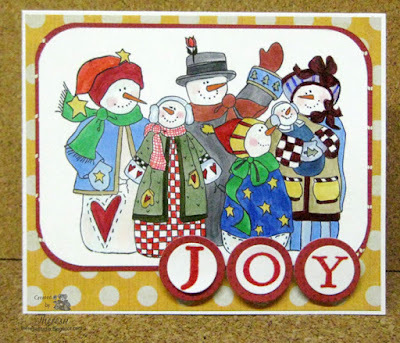 I stamped the word JOY with Martha Stewart Alphabet Letters and popped up on the card. 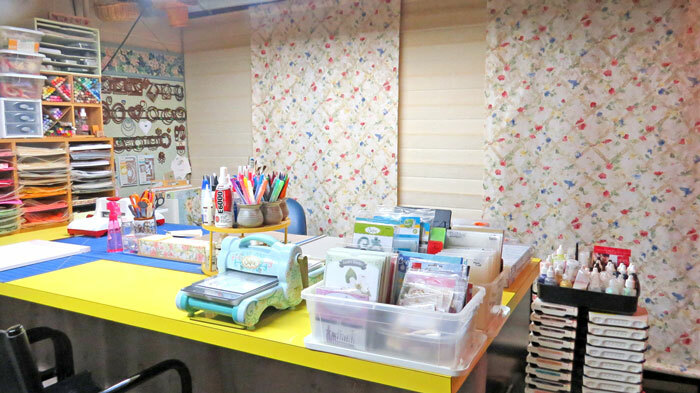 Other Supplies: Versamark, Red EP, Patterns from Crate Paper Snow Day pad and American Crafts Kringle pad, Nesties Circle dies, Corner Punch. As You Like It Challenge: Favorites-Bright or Pastels. Love brights...make such cheerful cards with brighter colors. 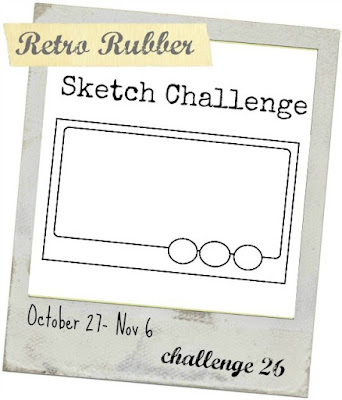 Please join in the challenge and fun at Retro Rubber. Since the Retro Design Team Ladies share childhood photos on the blog, I thought that I'd share a childhood photo too. Hello! I am hopping from holiday to holiday! 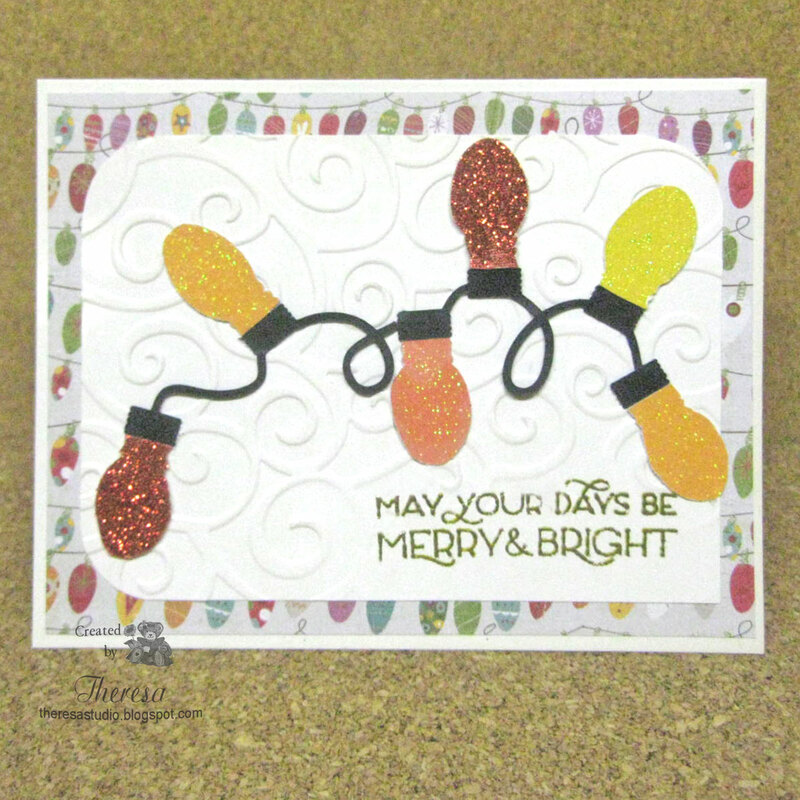 I have a second post today for a Christmas card that I made for Mod Squad Challenge Flip Flop to take a stamp you would normally use for one purpose, and use it for another. 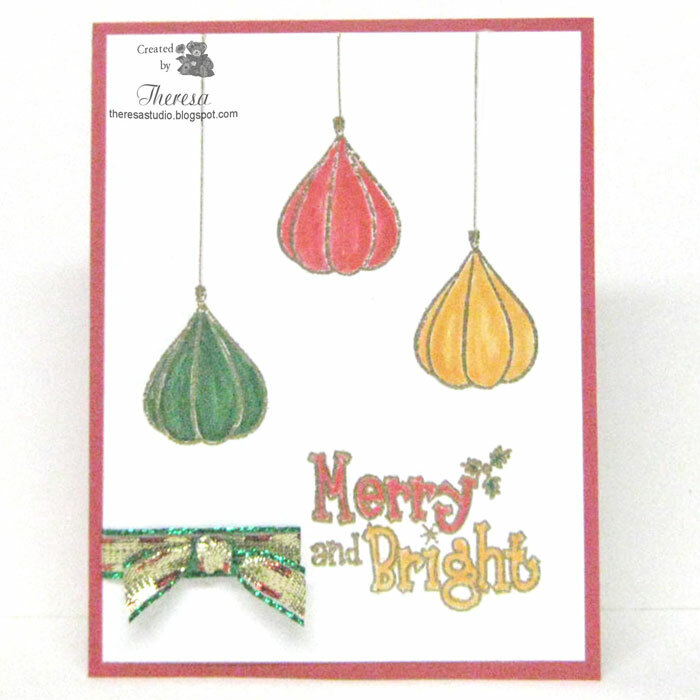 I have used a Repeat Impressions Hot Air Balloon stamp and actually flipped it to become a Christmas ornament. 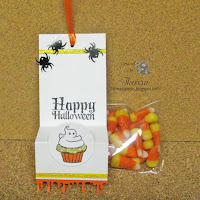 I stamped 3 times with Versamark and heat embossed with Gold EP and colored with markers. I added Gold Metallic thread to hang the ornaments and finished with some metallic ribbon and a Sentiment from Creative Clear stamps. Welcome! 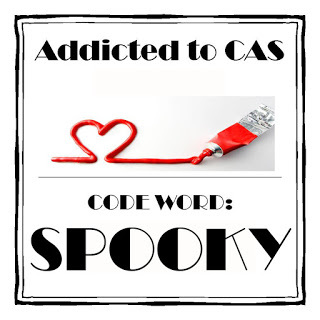 I have another CAS card for Halloween using some older Mark's Finest Paper stamps. This is the first time I have used these but they seemed to go with the sketch that I used. Love this fun cat with a hat! Supplies: Memento Tuxedo Black and Rich Cocoa inks, Copics, Purple Gelli-roll and Green and Purple Glaze pens, Clear Star pen, White and Orange CS. Hello! My plan today was to rake leaves but my DH says it's too wet so I have an excuse to stay inside and play in the studio. 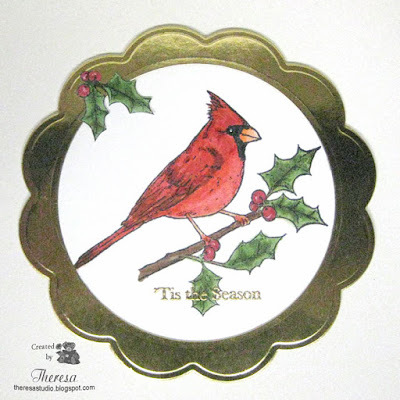 I created this card for some Christmas challenges using GKD Stamps and Gold Metallic CS with Blossom and Circle Dies to frame my image. The stamps are from GKD Peace and Joy. 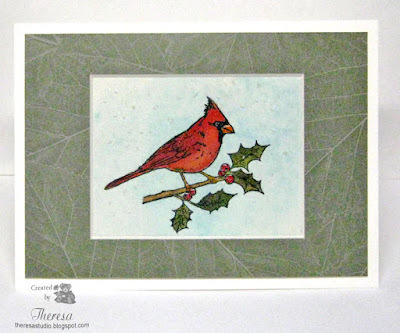 To the Frame, I added a sprig of Holly that I stamped, colored and fussy cut. Addicted to Stamps and More: #167 Make your mark. Used Copics . 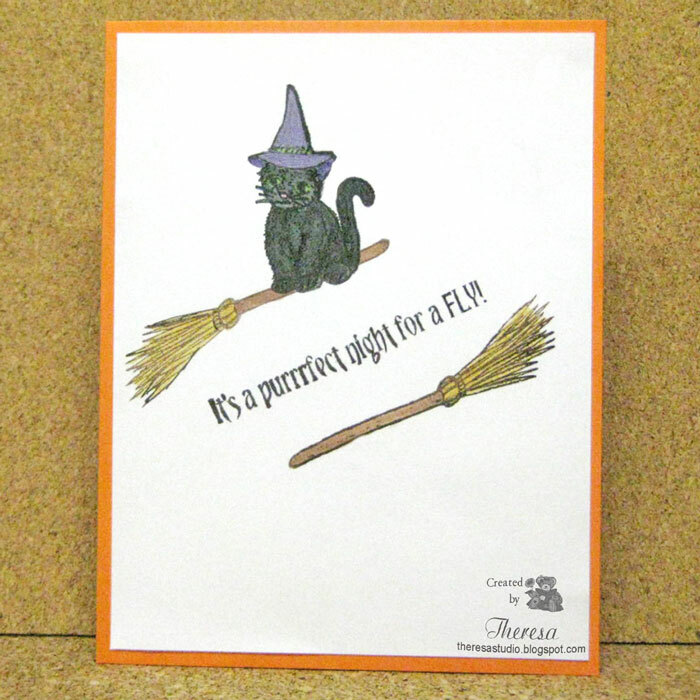 I am back for a second post today continuing with Halloween Cards. I made this a CAS Card using a Sketch challenge from CAS Colours & Sketches #147. 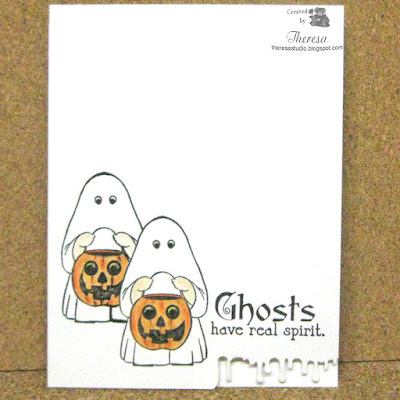 The first thought was to make a Christmas card but I had my Halloween stash and stamps on my desk so went with Halloween theme. Used masking to stamp the 2 Ghosts with Mark Finest Papers stamp and Memento Tuxedo Black Ink. Sentiment from same company. Colored with Copics. 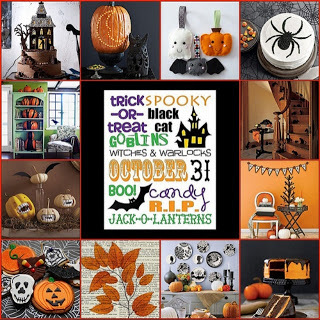 Used Clear Star on Jack O Lanterns. 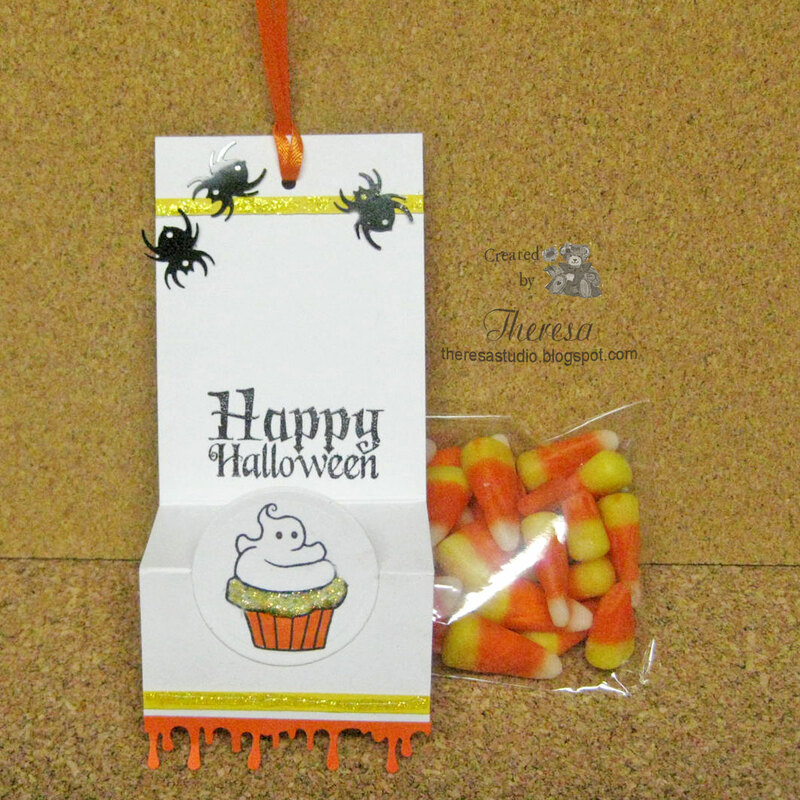 For a fun touch I punched a portion of the lower edge with Martha Stewart Drippy Goo border. Cards In Envy: Trick or Treat Card Challenge......cute little ghosts out Trick n Treating. A2 Size card is one layer. 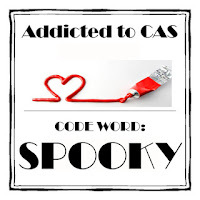 Addicted to CAS: Challenge 75 is Spooky...aren't all ghosts Spooky? Allsorts Challenge: Week 334 Orange, Purple. Black Use all three or any two. Made 2 versions-one has orange and black and on the second version below, I used all 3 colors by adding a purple strip. Hello! Frankenstein has left the house....the haunted house that is! He must be on his way to Trick or Treat! So be on the watch for the Monster! 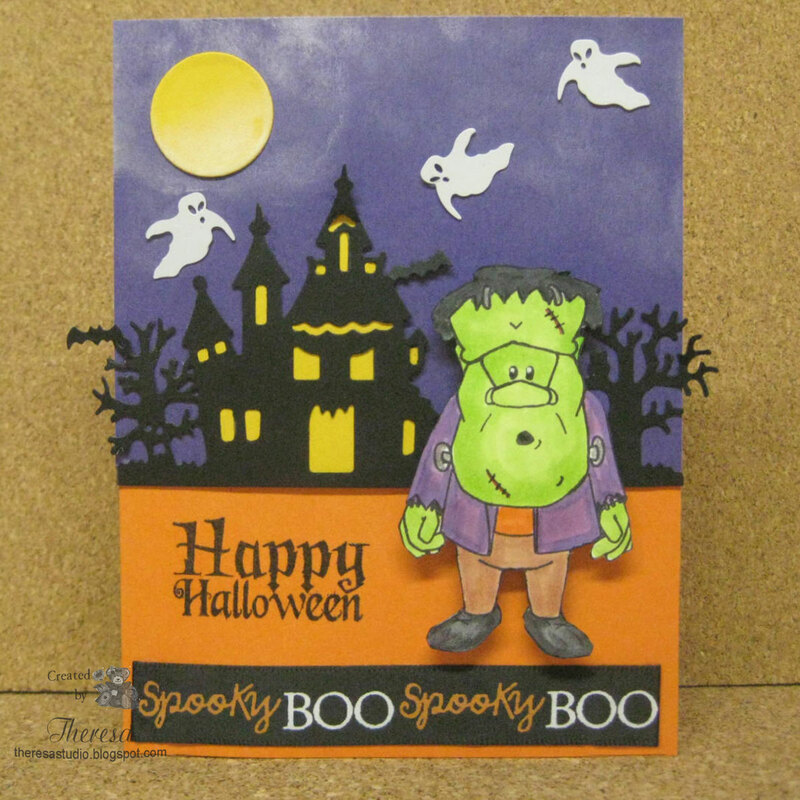 Supplies used for this spooky card: Mark Finest Paper's Stamps, Copics, Memento Tuxedo Black ink, Brilliance Moonlight White ink, Purple, Orange, Black CS, Snippets of Yellow CS, Cottage Cutz Haunted House Die, Nesties Circle Die, Plastic Ghosts, Spooky/Boo Ribbon from stash, Black Foam for popping up Frankenstein cutout. 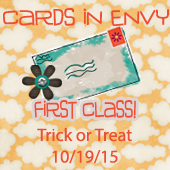 Cards In Envy: Trick or Treat challenge. This card meets specs for fitting a A2 envelope. Die Cuttin Divas: #238 Photo Inspiration below. Pulled colors and haunted house from photo. Used Haunted House die. Alphabet Challenge: R is for Ribbon. Allsorts Challenge: Week 334 Orange, Purple, Black -use all or two. To hear the video you must be on my blog. 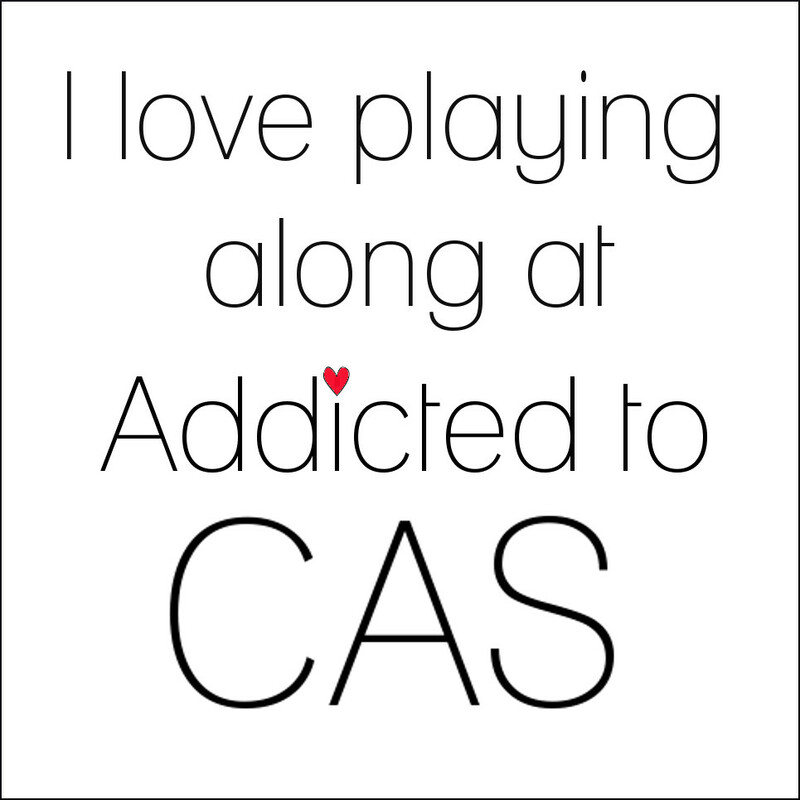 Will not play if you are viewing on Facebook. Hello! 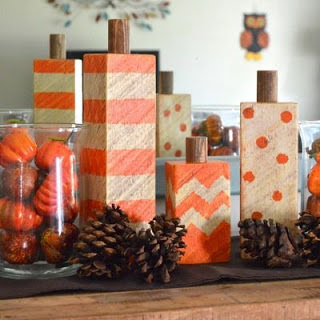 Today I have a fall scene project inspired by the WIW Photo Inspiration Challenge 02115 (on right) at The House That Stamps Built and I have to say I am very pleased with how it came out and how easy it was to do. 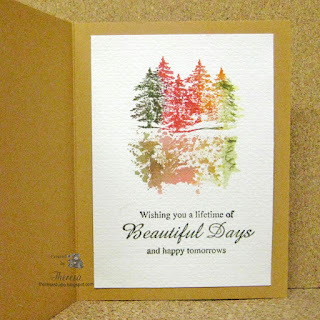 I used Repeat Impressions Large Pine Forest stamp and inked it with Distress Inks Forest Moss, Barn Door, Spiced Marmalade, Squeezed Lemonade and stamped on watercolor paper. I created a reflection of the trees by using a acrylic sheet with the inked stamp and then laid the acrylic on the paper to get a mirror image beneath the trees. I filled in with DI Stormy Sky and Crushed Olive using a water brush and sponged the sky with Memento Summer Sky ink. I was tempted to add more details but thought I'd better quit before I ruined it.....so easy to make a mistake at this point. I finished the card by cutting the image with a Spellbinder die, framing it with GKD Sun Kissed CS and an embossed layer of GKD Dusty Sage wrapped in a wide organza Ombre ribbon with a shimmer. Card base is GKD Honey Mustard CS. I finished the inside (shown below) with another scene on watercolor paper that I made in the same way as the front but kept more abstract. ( This was actually a trial run for doing the reflection). I stamped the Repeat Impressions Sentiment with DI Forest Moss. As You Like It Challenge: Favorites Brights or Pastels- My fave is bright colors, especially the bright colors of nature in fall. Alphabet Challenge: R is for Ribbon. My wide ribbon picks up the shimmer of the water in my scene. 613 Avenue Create: #146 Anything Goes. 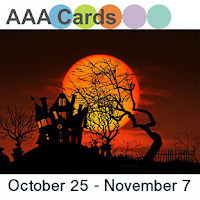 I do have some sights of Autumn in my card. House of Cards: October Challenge Texture and/or Color Challenge. 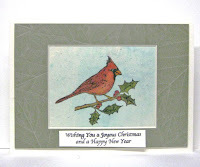 Used colors from graphic on right as well as texture in embossing on background layer. Don't you just love when you make a card that comes out much better than you envisioned? One thing about water coloring is that you don't always have control of the results. Sometimes, you just wish for the best! Happy Snowman Thinks He's Santa? Hi there! 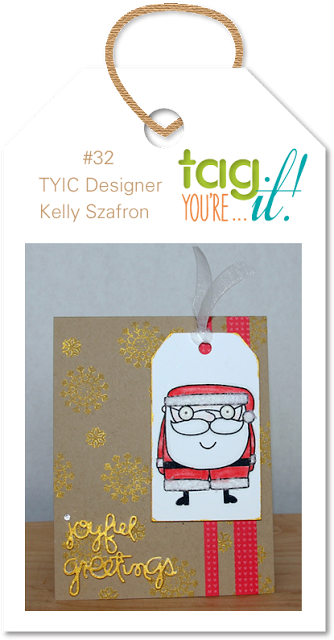 Today I have another Christmas card inspired by Challenge #32 at Tag You're It! I had planned to use a Santa theme but I realized that I really do not have many Santa stamps....several digi ones in my file... mostly vintage ones... not a really cute one like I wanted. Guess I have a reason to shop for stamps. 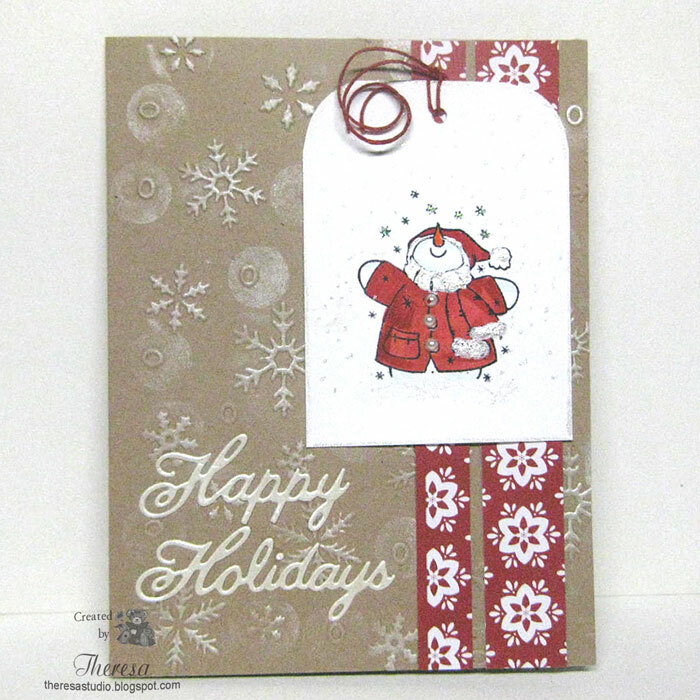 I decided to use this cute Snowman from Creative Clear Stamps set Let It Snow. He is kind of like the Santa on the inspiration graphic....kind of round and square-ish and I made his coat and Santa hat Red with Copics. 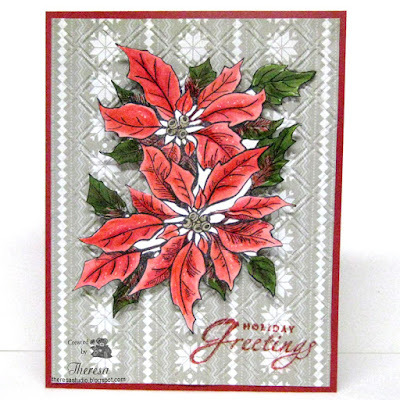 My layout was also inspired by the challenge....used Kraft and Embossed Snowflakes and 2 stripes of Pattern Paper. The words were die cut with Cheery Lynn dies from a Glossy Oyster Pearl CS. Pearls, Stickles, Clear Star pen and Twine finished the project. Inks used were Memento Tuxedo Black and Brilliance Platinum. 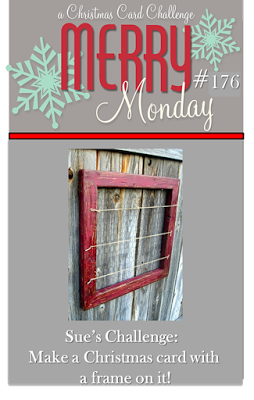 Mod Squad Challenge: Winter & a Die. Snowy theme and Words fit this challenge. 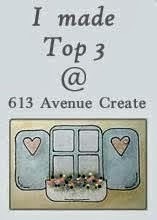 Creative Corner Challenge: Must have 3 embellishments. 3 pearls on Snowman's Coat. 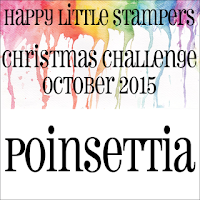 Addicted to Stamps Challenge: #111 Bling Bling / Glitter and Shine. Peals for Bling, Clear Star Pen and Stickles for Glitter and Shine. I am back with a second post and another Christmas Card. I have been making cards to share with the Caring Hearts card drive- read more below. I am using what might be my oldest stamp...not too sure but I know it was one of my first ones to buy. It is a PSX stamp dated 1992 and I have used it a lot in many designs. But this is the first time that I have colored it with Copics. After stamping with Memento Tuxedo Black ink on GKD White CS and coloring with Copics R22,24,27, G21,82,, Y28 , I decided to fussy cut the image. I attached this to a pattern paper layer (Fancy Pants Timbergrove pad) with foam tape and then to a Red card base. 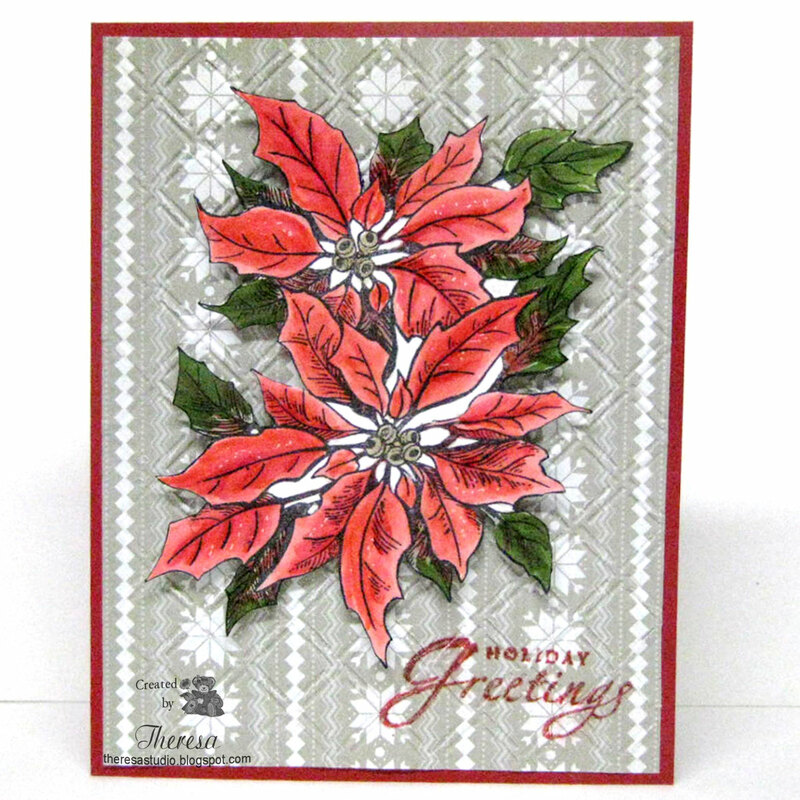 I thought this pattern looks like a stylized poinsettia image and went well with the stamp. I embossed the paper with Cuttlebug Wicker Weave EF. 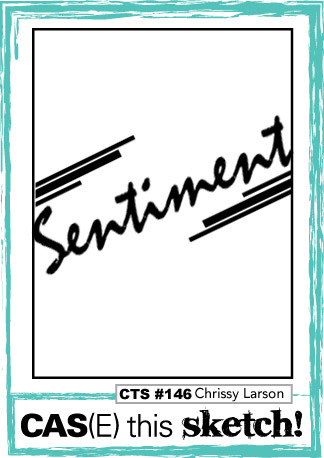 The SU sentiment was stamped and heat embossed with Red EP. Have you heard about Caring Hearts Card Drive? 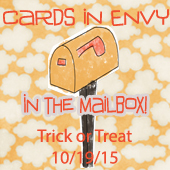 This is a drive to collect handmade cards to give to those that live in nursing homes. Caring Hearts Card Drive is all about bringing joy and holiday cheer to the elderly that are often quite lonely. See more here if you are interested. I will soon be sending a box of cards to support this drive. 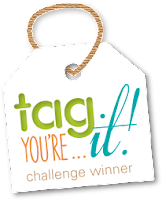 Sweet Stampin' Challenge: Antiques Roadshow-Use oldest stamp. Mine is a PSX from 1992. Hello! Today I am changing gears to Christmas Cards. Maybe it's the cooling temperatures that inspire me to think of the coming holidays. 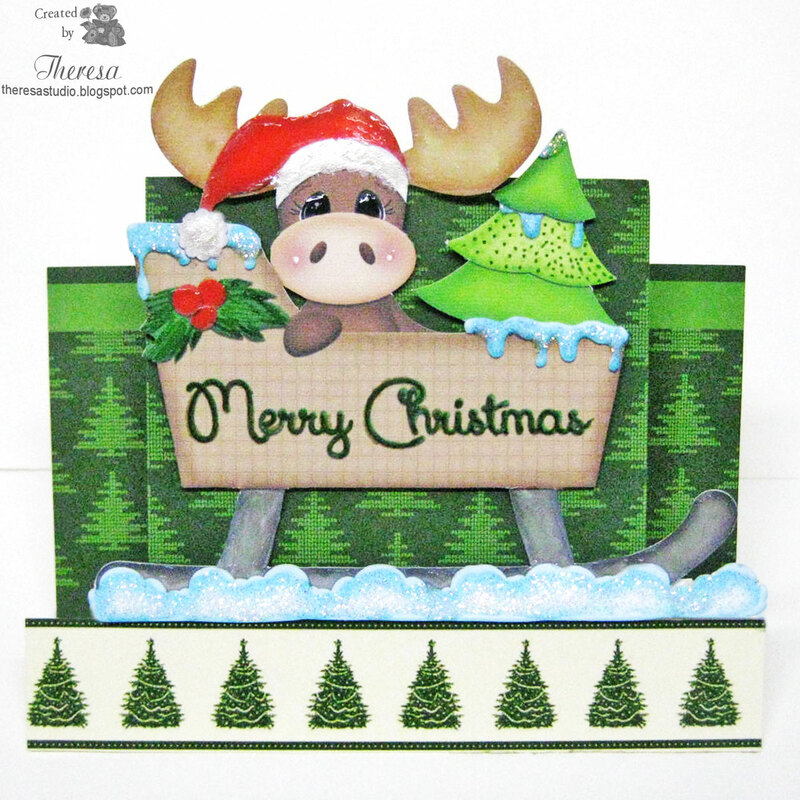 I printed and cut the Moose riding in a Sleigh from Stinkin Cute Paper Piecings with the Cameo. I designed a center step card using paper from American Crafts Kringle and Co pad. 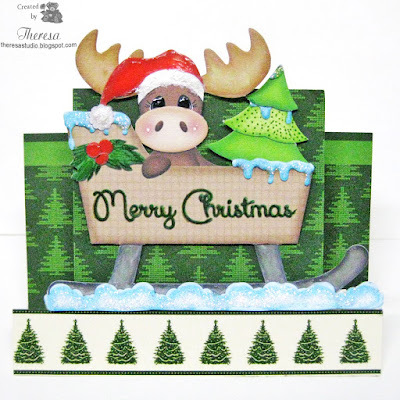 I added Glossy Accents to the antlers, eyes, cap, sleigh runners, and berries. 2 types of Stickles were added to the snow and fur on the cap. 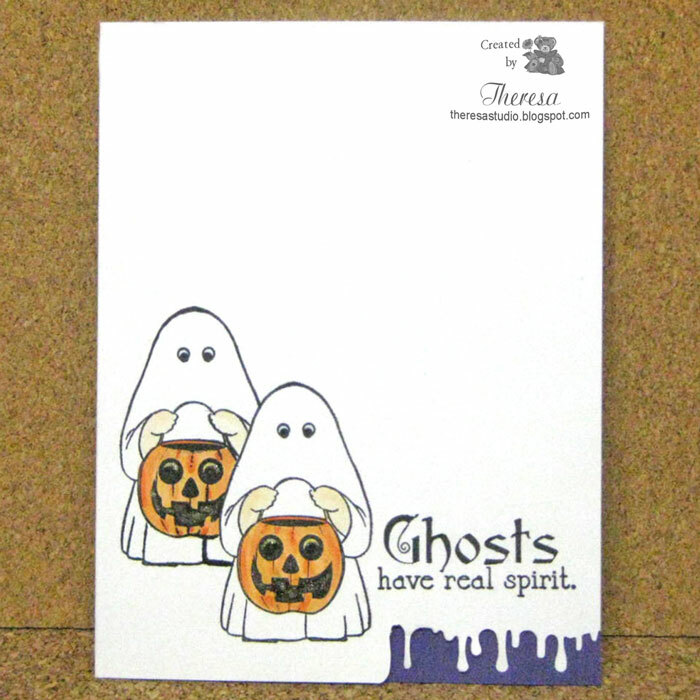 A Glaze pen was used on the sentiment to give some dimension. A fun Card! 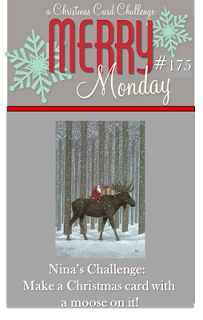 Merry Monday Christmas Challenge: #175 The moose is loose. Are you ready for cold and snow?